I received this product or service for free or discounted price in exchange for an honest review. All thoughts and opinions are my own. No monetary compensation was received. Note: This article contains affiliate links, which means I receive compensation if you purchase a product through them. Visit my disclosure page for more information. My kids start school in about two weeks. Crazy how time flies, huh? It almost feels like summer just started but it’s quickly coming to a close. We are ALL ready to get back to our normal routine. Summer throws everything out of whack. We need normalcy back! We thrive on bedtimes, deadlines, and schedules and the school year gives that to us. To thank my children’s teachers for all they do (they do even more for us than they know) I wanted to give them a welcome back gift. I could have scoured Pinterest for some super cute DIY gifts but to be honest I am short on time these days. I still wanted something super cute and AMAZING to give my boys teachers. Thankfully, I was introduced to Teacher Peach. 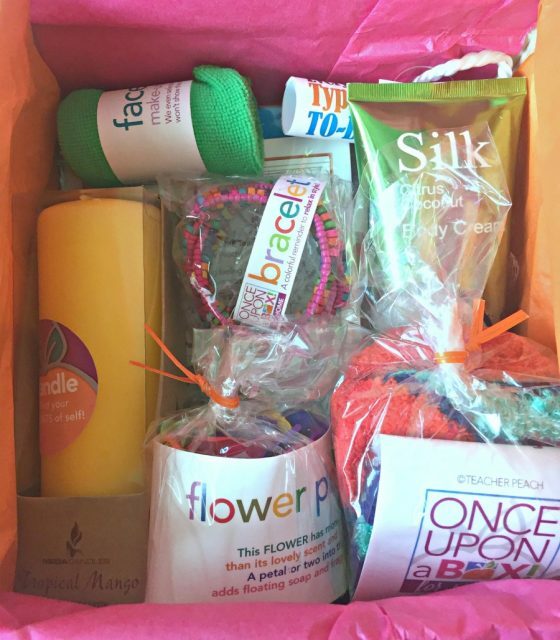 Teacher Peach offers an array of products perfect for students, the classroom, and of course teachers. 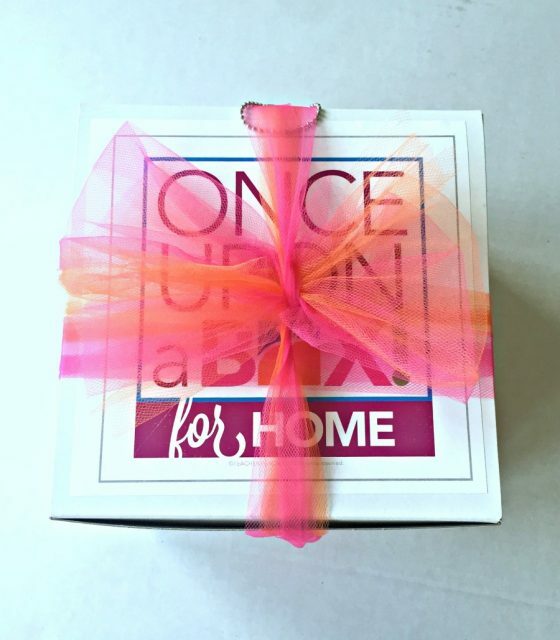 The “Once Upon a Box for HOME” is the perfect way to say welcome back. It features items to help them relax and recuperate after a long days work teaching your kiddos. You know the feeling, right!? Happiness mixed with a tad of wanting to pull your hair out. Teacher peach boxes come fully assembled. They are completely done from top to bottom. Topped with a colorful bow and packaged nicely in coordinating tissue paper. No need to get covered in glue or paint with some crafty project that probably will end up in the trash anyway. Teacher Peach boxes are WAY easier! 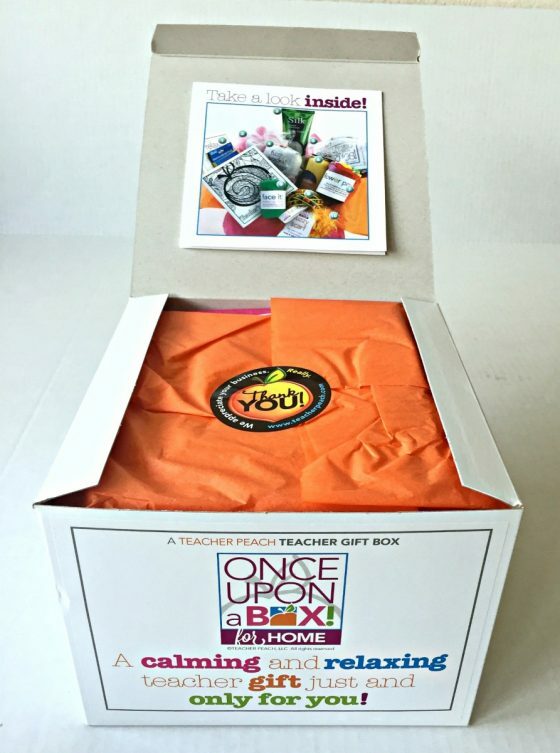 Inside the “Once Upon a Box for HOME” you will find 10 individually packaged items there to pamper your teacher while she or he relaxes at home. A boxed 5-inch tall scented candle. A bath soap flower, face cloth, and flower-shaped scrubbie. The cosmetic bag includes a silky eye mask, a make up brush, pedicure spacers, a comb, headband, and pumice stone. Coconut citrus body cream, a beaded colorful bracelet, and a fuzzy scarf. A Teacher Peach’s First Official Teacher’s Coloring Book, colored pencils, and pencil sharpener. Discount codes and offers for more goodies! The “Once Upon a Box for HOME” runs a mere $39.95 which seems like a TON if you are comparing it to popsicle sticks and pencils. I believe teachers deserve WAY more than they get. They spend all day supporting the educational, emotional, and social needs of our children (tomorrow’s future!). We all know it’s not always easy dealing with children. Give your teacher’s confidence a boost and let her or him know how much you truly appreciate all they do. After all, we all benefit in the end! Why grapple with an apple when you can Reach for the Peach! 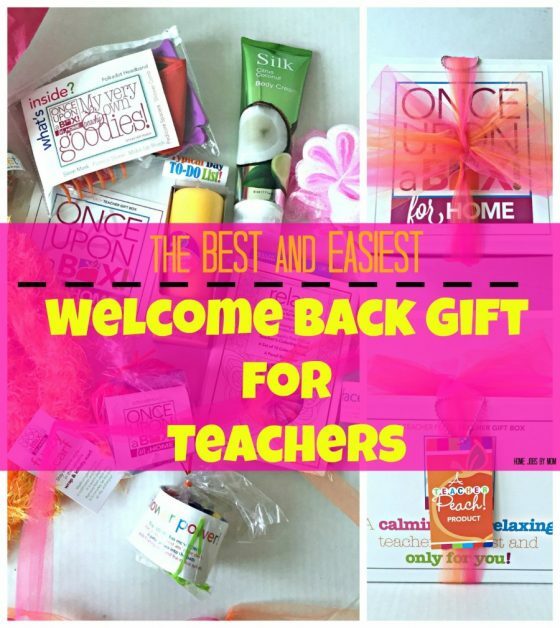 These are some great gifts for teachers. What a cool box.